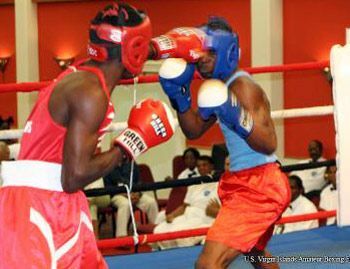 The 16th OECS Boxing Championships, held in Grenada at the La Borie Sporting Complex, saw Grenada coming out victorious, with 22 points, on the final day of competition on Sunday, November 30th, 2008. St. Lucia placed second, with 16 points. Third was Dominica with 12 points. St. Vincent and the Grenadines took the cellar position with 10 points. King, who was competing in the championships for the first time, defeated Lester Seraphind of Dominica on a TKO decision to win gold in the Welterweight Division on the night of the Finals. In the main attraction bout for the night, Lorenzo Duncan lost to Christopher De Allie, of Grenada, losing his OECS title in the Heavyweight Division, while newcomer Elroy Alexander lost to Jaime Bullen, of Grenada, in the Super Heavyweight Division. SVG was also represented by former OECS light Welterweight Champion Jahzeil Lewis and Leland Robertson in the Middleweight Division. Both boxers lost on points in the semi-final round on the previous night of competition. The team was accompanied by Coach Carvanaugh Gumbs, Referee/Judge Leslie Pope and President Winston Telesford. The team returned home last Sunday. Commenting on the teamâs performance, Manager Winston Telesford noted that SVGâs bottom-place position was not as a result of a poor showing, but as a result of only fielding five athletes in the nine divisions. The teamâs participation in the Championships was made possible by the National Lotteries Authority and the National Olympic Committee.